Scottish castles evolved from purely defensive structures into more comfortable and prestigious lordly residences in many different ways. Sometimes a tower house found itself buried within a later mansion that had grown around it. On other occasions, a fresh start was made on a grand mansion on a new site and, once it was complete, the castle the family had called home for centuries was simply abandoned. Elsewhere, it is not unusual to find later mansions growing out of the side or the back of earlier castles. 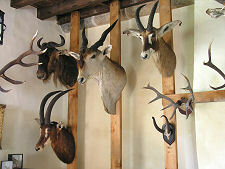 But at Castle Fraser, the owners took a different route. Here they responded to the need for more, and more comfortable, accommodation by sticking to a basic form of a tower house castle, but simply making it bigger. The result is one of the most superbly evolved, and impressive, tower houses in Scotland. The origins of Castle Fraser date back to the mid 1400s when James II took over the estates of the Earldom of Mar and broke them up into smaller baronies, each of which he granted to a trusted supporter. On 29 October 1454 James II granted the lands around Muchall and Stoneywood to one Thomas Fraser, who in part-exchange surrendered to the crown his lands at Touch and Cornton, to the west and north of Stirling respectively. It is possible that a castle already existed here by then, but if not, Thomas Fraser took rapid steps to secure his hold on his new barony by building a three storey rectangular tower house which today continues to form the core of the castle. 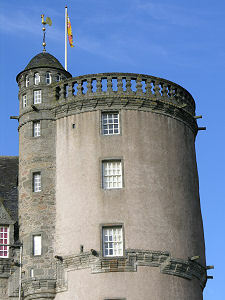 At the time it was known as Muchill-in-Mar Castle. The Frasers prospered in their new environment. 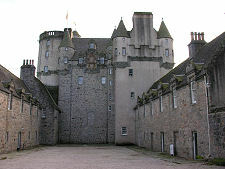 By 1570, the then laird, Michael Fraser, started work on a major upgrade and expansion of what by then was probably feeling a very dated and fairly small residence: and one that would certainly have failed to offer the prestige needed to reflect what the Frasers would have felt to be their proper place in society. 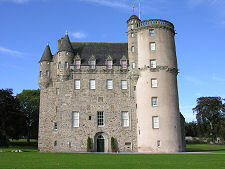 Michael Fraser's original plan seems to have been to extend the floorspace by commissioning master-mason Thomas Leiper to build a large tower offset from the north west corner of the existing castle, which became known as the "Michael Tower". 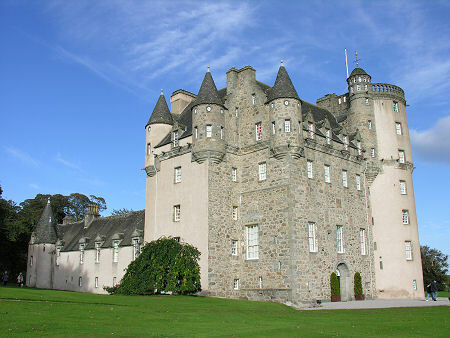 Perhaps inspired by work being done on other Aberdeenshire castles at the time, or perhaps influenced by his mason, the plans then grew to include a second additional tower. This was to be the large circular tower you now find at the south east corner of the original castle and the result, with towers added to opposite corners of the existing structure, was a classic "Z-plan" tower house. 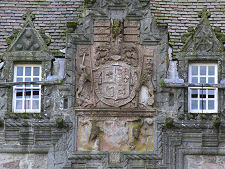 Among the decorative motifs added to the exterior of the castle were a number with overtly Catholic origins, a rare and rather brave thing to do in a post-Reformation Scotland, and possibly a reflection of the power enjoyed by the Frasers in the wider area. The work on the two new towers was still incomplete at the time of Michael's death in 1588. Michael's son Andrew took up the project on reaching adulthood in 1592, and by 1618 he had completed the expansion his father had begun. 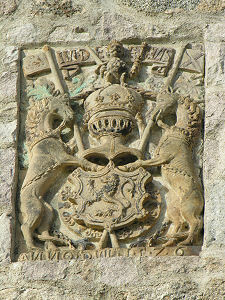 Andrew employed as his master mason John Bell, who left his mark at the foot of the large armorial panel that was added to the north face of the tower, in the form of a coded message that probably means "John Bell the mason made me". During Andrew's time the Fraser family fortunes reached their high point, and he was made 1st Lord Fraser before, in the 1630s, building two new wings extending north from the castle and enclosing a courtyard. To all intents and purposes, 190 years after the Frasers were granted the estates here, Castle Fraser was recognisably the building you see today: though still usually known at the time as Muchill-in-Mar Castle. 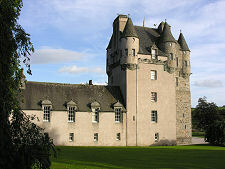 The fortunes of the Frasers, and their castle, took a series of knocks during the rest of the 1600s. The 2nd Lord Fraser, another Andrew, who inherited the estate in 1636, was a strong opponent of Charles I's efforts to impose an Anglican pattern on the Church in Scotland and became an avid Covenanter: making him in some eyes a rebel against the king. As a Covenanter, Andrew Fraser took a direct hand in the early stages of the conflict, leading the sacking of the Bishop's Palace in Aberdeen. 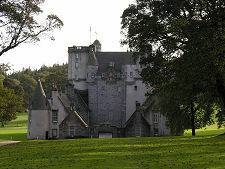 In retaliation, Royalist forces under Lord Aboyne attacked Fraser's castle and, though they failed to capture it, they were able to destroy crops and agricultural buildings on the estate. Worse followed in 1644 when the leader of the Royalist forces in Scotland, James Graham, Marquis of Montrose, attacked, captured and sacked Muchill-in-Mar Castle. The 3rd Lord Fraser (yet another Andrew) inherited in 1656, but was unable to restore the fortunes of the family or the estate. When his son Charles became 4th Lord Fraser in 1674 he cleared the family debts by transferring ownership of the castle and the estate to John Erskine, Earl of Mar, to whom he was related by marriage. 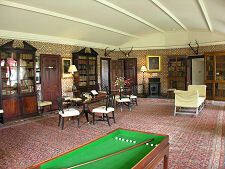 In return, he was allowed to continue to live at Castle Fraser. As a result of this arrangement, however, was bound for life to Mar, being obliged to supporting Mar's pro-unionist stance during the Act of Union debates and votes in the Scottish Parliament in 1707. He was also obliged to support the Earl of Mar when the latter raised his standard for the Jacobite cause during the 1715 uprising. Following the defeat of the uprising, Charles Fraser became a fugitive and the following year, while still on the run, he died after falling over a cliff at Pennan. As Charles Fraser died without heirs, the title of Lord Fraser passed to his wife's heirs by her first marriage, and through a complicated series of inheritances over three further generations the castle ended up in 1787 in the hands of Miss Elyza Fraser, a spinster in her 50s. 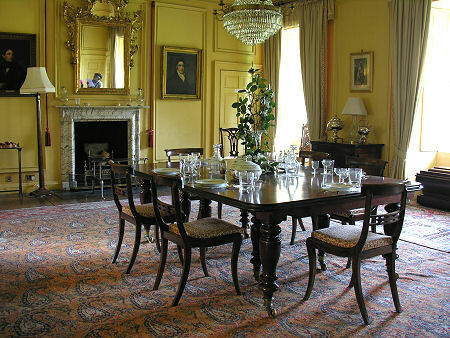 What she inherited had since 1695 officially been called Castle Fraser, and it was Elyza who, after a gap of 150 years, began a further round of modernisation of the castle. Her nominated heir was her nephew, Alexander Mackenzie, who adopted the name Alexander Mackenzie Fraser, but as he pre-deceased Elyza, Castle Fraser passed to his son, Charles Mackenzie Fraser. Charles was an officer in the Duke of Wellington's army during the Napoleonic wars. 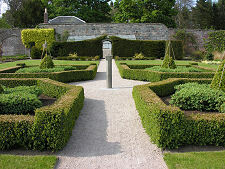 Charles undertook a series of building projects in and around the courtyard of Castle Fraser and in respect of the internal arrangement of the castle. 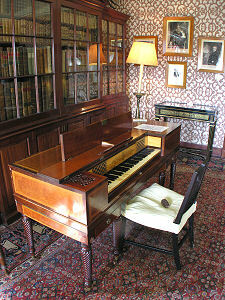 Two generations on, however, and Castle Fraser stood empty and increasingly derelict. The estate had been inherited by Thomas Fraser Croft Fraser, who rose through the Catholic priesthood to become Privy Chamberlain to the Pope in the Vatican, and Castle Fraser was put up for sale. It was purchased in 1921 by the 1st Viscount Cowdray as a suitable renovation project and home for his second son, Clive Pearson. 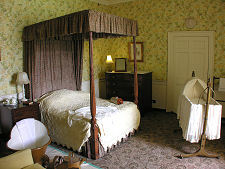 Clive Pearson worked to restore Castle Fraser to its previous glory until 1946, when he gave it to his second daughter, Lavinia. 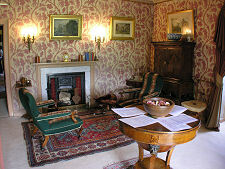 Together with her husband, Major Michael Smiley, Lavinia continued the work of restoration until, in 1976, she gave Castle Fraser and 26 acres of surrounding land to the National Trust for Scotland. 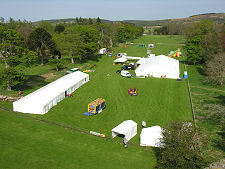 The NTS purchased a further 320 acres of the surrounding land in 1993, allowing the castle once more to sit as an integral part of a much wider estate. Today's visitor to Castle Fraser finds a building that, apart from some of the courtyard detail, would look familiar to the 1st Lord Fraser at the time of his death in 1636. 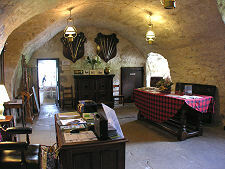 Entry is via the door in the south face of the castle leading directly into the vaulted laigh hall. From here you can explore a surprisingly large part of the castle. 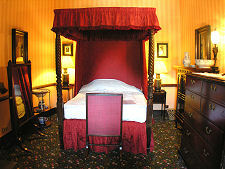 From the laigh hall you first visit the Michael kitchen, in the ground floor of the Michael Tower. Meanwhile, steps lead up to the first floor great hall, the most commanding space in the castle, and one which many owners at one time or another altered, either in detail or more substantially. 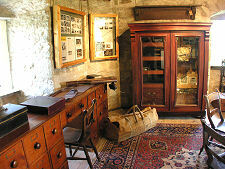 Moving from the great hall along a passage to the dining room takes you from castle to mansion. 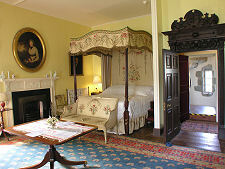 More stairs, this time within the round tower, take you ever higher, to the green room and pink room, both bedrooms. 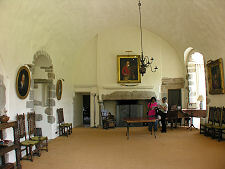 Above them on the fifth and sixth floors of the round tower, you find Lavinia Smiley's sitting room and Major Smiley's room, set out to commemorate the castle's last owners. 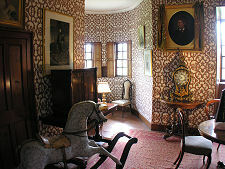 They actually preferred to live in the castle's stable block, but the first room reflects Lavinia Smiley's interests as an artist, writer and photographer, while Major Smiley's room has an altogether more masculine feel. This is perhaps fitting as it remembers one of the few allied prisoners of war to escape from Colditz Castle during World War II and a man who, after later marrying Lavinia, turned his attentions to running the estate and its famous herd of dairy cattle. 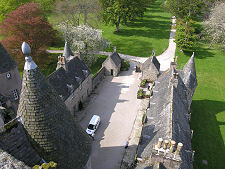 Continuing further up the round tower brings you out onto its roof, which offers magnificent views over the castle itself and the estate. To continue the tour you make your way back down to the level of the pink room and back into the main body of the castle where you find the large library. Crossing the library brings you into the upper reaches of the Michael Tower. Here you find two turret rooms and two tower rooms, one of which serves as a trophy room, and from here your onward tour becomes a downhill one and you follow stairs down to the bedroom known as the worked room and the north bedroom. 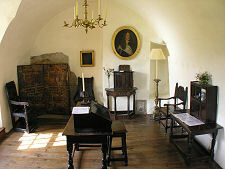 Lower still and you come to the chapel, a stone vaulted room whose actual purpose may have been to store valuable charters and deeds. 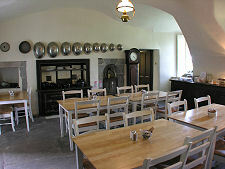 Having finished your tour of the castle via the shop and tearoom, it is worth remembering you still have a large walled garden and hundreds of acres of surrounding estate to explore!